I spent the weekend judging a USDAA trial in Camarillo, CA. You know, I showed my long gone Sheltie dogs Winston and Kelsi there circa 1991. I used to know all the folks that played in agility in southern California. I half expected to see a bunch of my old cronies. But it wasn’t that way at all. I did see Marq Cheek; and of course Karen Moureaux was host of the trial. It is inescapable that agility is the same thing today that it was 25 or 30 years ago. I’d say that the average competitor is basically the same kind of creature that we all were back then. The better handlers and dogs are possibly a bit better than they used to be. But on average, it’s the same sport. The design premise is basically a “cluster”; an arrangement of obstacles that create multiple entry and exit possibilities. In my dream I envisioned contiguous hexagonal shapes. 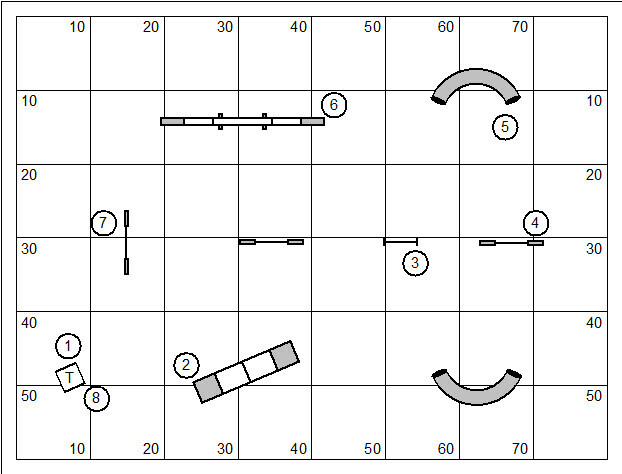 What I discovered about the basic design principle is that it created a variety of transitional distances. From the dismount of the weave poles through jump #11, for example, the dog is working in full extension. Jump #11 through jump #13, however, is a very tight pinwheel in which the dog must be held in collection. While the qualifying percentage on this course was quite low, it was not by any means a skunk of the class. Dogs qualified at about every jump height… demonstrating then that it could be done. The biggest design challenge ever in the Masters Challenge Biathlon courses is giving the dog plenty of room to work at full extension and at full speed. If a class is skunked on account of time, then it means that the course demands too much in the way of collection. You know, people don’t really appreciate the work of an agility judge. I spend a minimum of three or four days designing courses. A weekend assignment usually requires a couple of grueling travel days. And, you get to stand out in the sun and rain all day long collecting a $buck a dog as the sole compensation for the work. Yep, it’s pretty close to minimum wage. And frankly, it was a $buck a dog 20 some years ago. 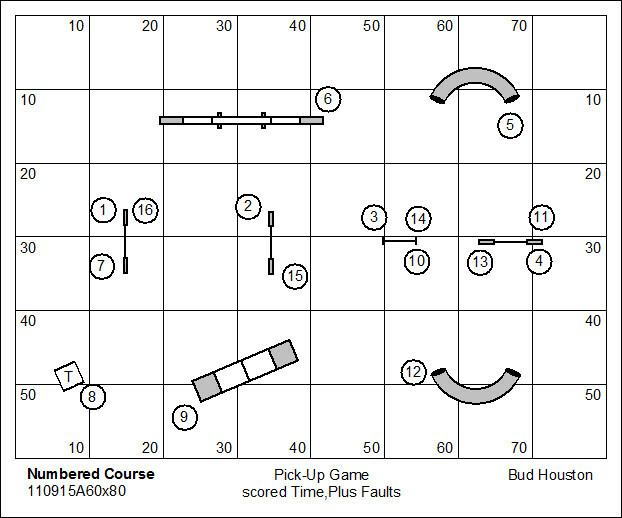 The part of this that I really like is course design. I’m not one to recycle courses. And, while I might obsess on a type of challenge over time, I’m constantly exploring new kinds of challenges that test the handler’s analytical abilities. I have a variety of rules for design that are my own, and not the dictate of the respective agility organization. I’m a big fan of nesting. I believe in designing appropriate to level. And I’m very sensitive to the separation of control positions on a course (I’ll be damned if I’ll design a course that only long legged kids can survive). The physical demands of judging are getting to wear on me a bit. Sun burnt and sun struck and chasing damned border collies back and forth on contacts are the relentless demands of a weekend of judging. All the while you’re expected to have a mind like a steel trap. I’ve learned to forgive myself when the trap is a bit rusty. People don’t jump in and help like they did when I was coming up. They complain a lot and want to be served. Jesus… what’s that about? The weekend took a lot out of me. And I’m trying to wrestle down a variety of thoughts. I probably sound like I’m contemplating retirement. That’s an illusion. I don’t know how to quit or stop or retire. 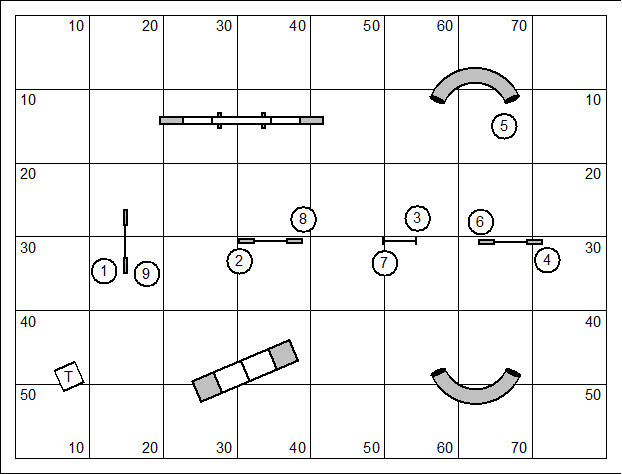 I’ve been working on agility league play for years now. In 2016 I’ll promote it in earnest. I’m not a salesman or anything like that. I just want an outlet for competition that isn’t based on the same old tired “rational” model for the sport… you know what I mean, the grind for titles. The National Dog Agility League finally has some traction. I do believe that Australia is coming on board shortly. Today success in agility demands micromanaging the agility dog. I believe that agility can be something amazing and spectacular. The game should be open and inviting to anyone who wants to play. It should be inexpensive. It should be fun. That is the model that we should strive to create. I’m aware that the agility small business operator wants to make a living. And so the model should nearly exclusively reward that person/business who takes all the risks and does all the work… with an appropriate income. And so the model should do exactly that. This is tricky business. And it’s the perfect opportunity for the early adopter. You are currently browsing the Bud Houston's Blog blog archives for November, 2015.